FUN ACADEMY are delighted to announce the UK release of the heart-warming animated tale SGT. STUBBY, in cinemas and on demand on 10th August 2018. 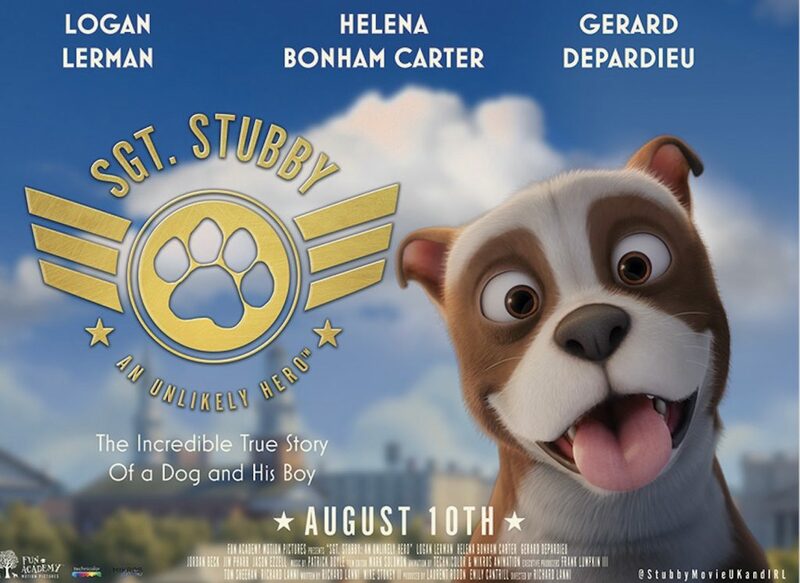 Directed by Richard Lanni and with a stellar voice cast including Helena Bonham Carter, Gerard Depardieu, and Logan Lerman, the film is based on the incredible, real-life story of America’s most decorated dog – a stray rescued from the streets of New Haven, Connecticut, by a young doughboy on the eve of America’s entry into World War I.
Narrated by Robert’s sister Margaret (Helena Bonham Carter, Ocean’s 8, the Harry Potter films, The King’s Speech, Sweeney Todd), Stubby and his new best friend quickly find themselves in the trenches of France. Befriended by French poilu Soldier Gaston Baptiste (Gérard Depardieu, Life of Pi, Cyrano De Bergerac, The Man in the Iron Mask, Green Card), Stubby accompanies the duo along their epic journey through harsh conditions and incredible acts of courage. As combat rages around them, Stubby keeps the trenches vermin-free, alerts his comrades-in-arms of incoming attacks, rescues the wounded in No Man’s Land and even catches a German spy! Back home, his exploits make the front pages of newspapers across the country and steal the heart of the nation.